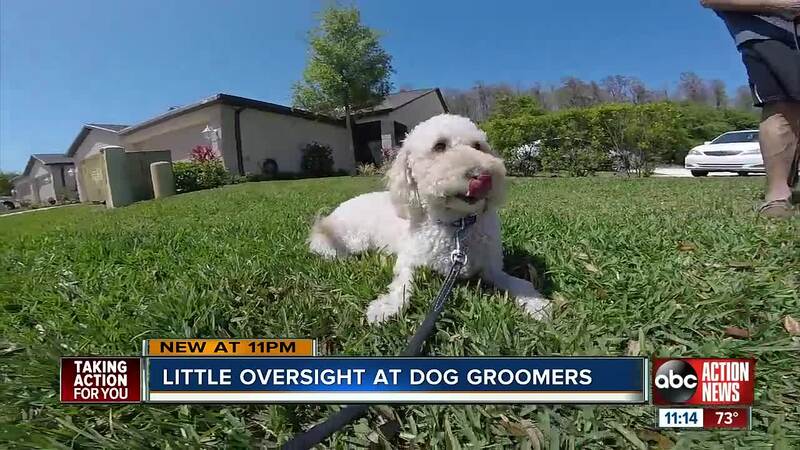 TAMPA, Fla. — Pet owners reported a series of local grooming visits gone bad and ABC Action News uncovered there’s little oversight in Florida – and across the country – when it comes to those caring for your pets. ABC Action Reporter Ryan Smith found that unlike beauticians and barbers, there are no education requirements for pet groomers. “I didn’t realize it was so lax,” said Danielle Ho of the Humane Society of Tampa Bay. ABC Action News started digging into the issue after a Satellite Beach groomer was arrested for felony animal cruelty. In February, the Brevard County Sheriff personally walked James Cordell Doughy Suthann into jail after he was caught on camera abusing a service dog. The video shows Suthann twisting the German Shepard’s tail and swinging the dog off the ground. The dog’s owner, a veteran suffering from PTSD, said his pet needed emergency surgery after the Feb. 6 incident. ABC Action News uncovered untrained pet groomers aren’t just a problem in Florida. Groomers are not required to have formal training in any state, but grooming workers who complete a certificate program or apprenticeship can earn higher salaries, ABC Action News found. Brienna Mitchell has been pushing for more oversight after what she describes as a grooming visit gone wrong at a Tampa PetSmart nearly a decade ago. Her golden lab, Buttons, suffered a hematoma and lost a portion of her ear. The chain said it paid for the vet bills as a “gesture of goodwill” after the family reported the injury two weeks later, but denied its groomer caused any injury. PetSmart says its groomers undergo at least 800 hours of training. But that’s not always the case at other pet grooming businesses, because there are no Florida rules requiring training or licensing for groomers. “I’m very shocked to know that they don't need any type of actual training – that anyone could just go in and be like, ‘I want to be a groomer,’” said Mitchell. Experts say owners can keep their pets safe by asking friends and family for referrals and looking for a groomer who has attended a registered pet grooming. Pet owners should also ask how many dogs the groomer sees per day and make sure pets meet the groomer before signing up for any services.